AVT recommended fitting a suitable brace to support the weight of the hand valve from the valve flange back to the main line (vertical pipe). AVT recommended using of AVT's Easy-Brace®. 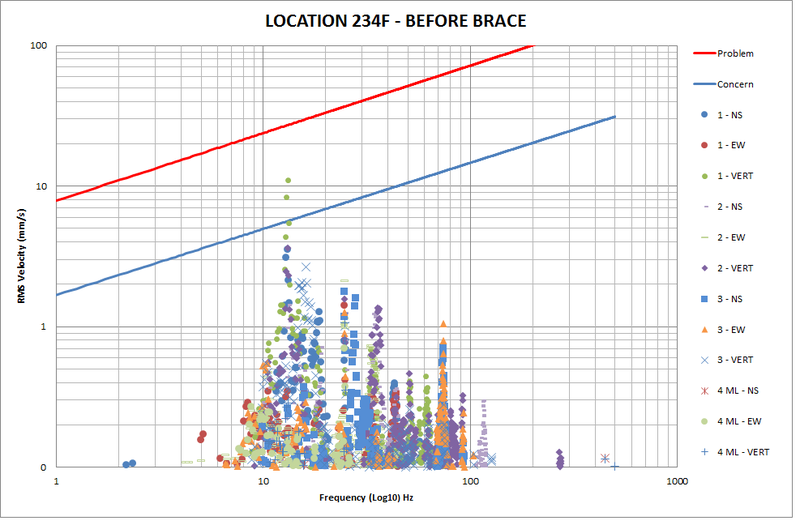 The Easy-Brace® installation resulted in significant reduction in vibration levels and this was confirmed by before and after vibration measurements as shown below. 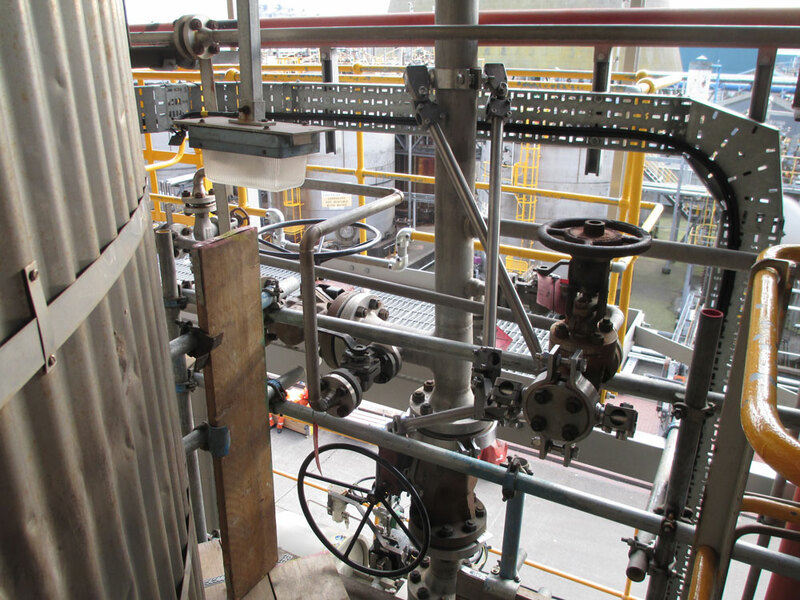 Vibration was measured on a number of small bore pipework connections on an acid plant and found to be below the EI ‘Concern’ line. However, since the Small Bore Connection was fitted with two heavy valves and the small bore pipework was unsupported for a significant length, AVT recommended that bracing should be introduced as a precautionary measure. For the SBC, AVT recommended fitting a suitable brace to support the weight of hand valves back to the parent mainline. Similarly, it was recommended that the unsupported lengths of small bore pipework were braced back to their parent pipe that ran close by. In all cases AVT recommended the use of the simpler Mk1 version of AVT’s Easy-Brace®. This brace solution is ideal when the pipework clamps are within the same plane. For out of plane bracing AVT Easy-Brace would be required. 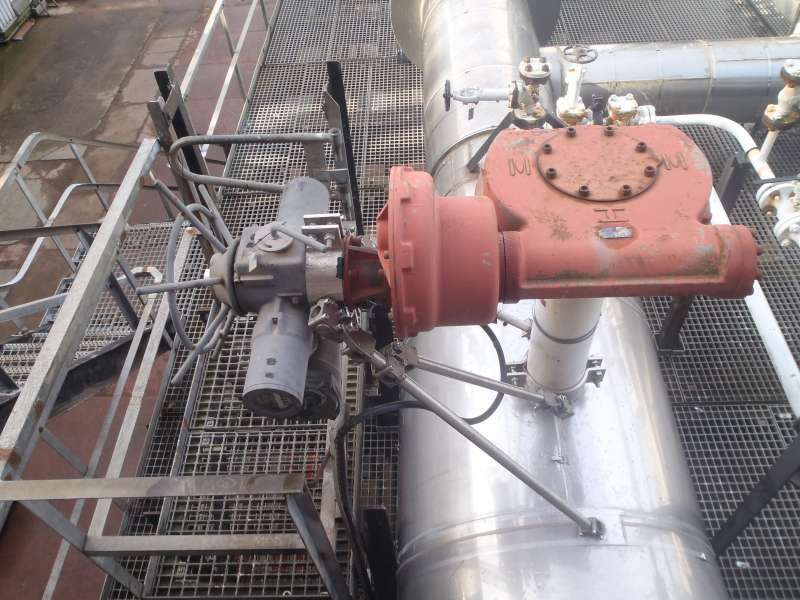 High levels of vibration were found to be causing repeat failures of a Rotork actuator unit on a gas line. Failures included oil leaks from the actuator and damage to the electrical connector. Vibration measurements indicated that the actuator vibration exceeded the EI ‘Concern’ line. AVT recommended fitting AVT’s Easy- Brace® system to help support the weight of the actuator back to the main line. High vibration was observed on a 6" hydrocarbon main line and associated small bore pipework. AVT recommended installing GERB Visco-Dampers to the main line and bracing the Small Bore Connection pipework back to the mainline. However, the client decided to resolve the main line vibration themselves but in the meantime asked AVT to provide AVT Easy-Brace system for the SBC’s. 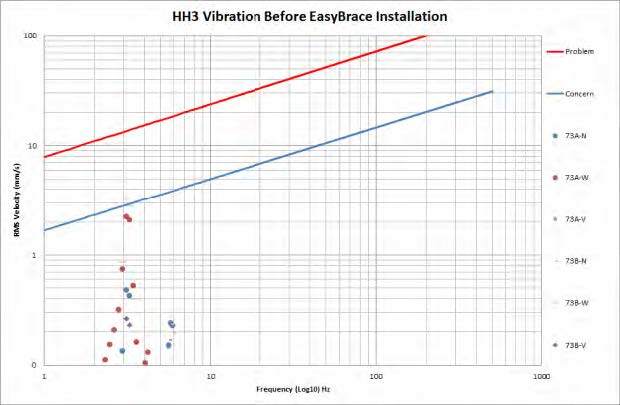 Easy-Brace® was installed and at Position 13, vibration measurements indicated a reduction in vibration at Small Bore Connection natural frequencies but not at the mainline dominant frequency. This was due to the high mainline vibration problem which had not been addressed. Therefore the brace was removed until it was resolved. 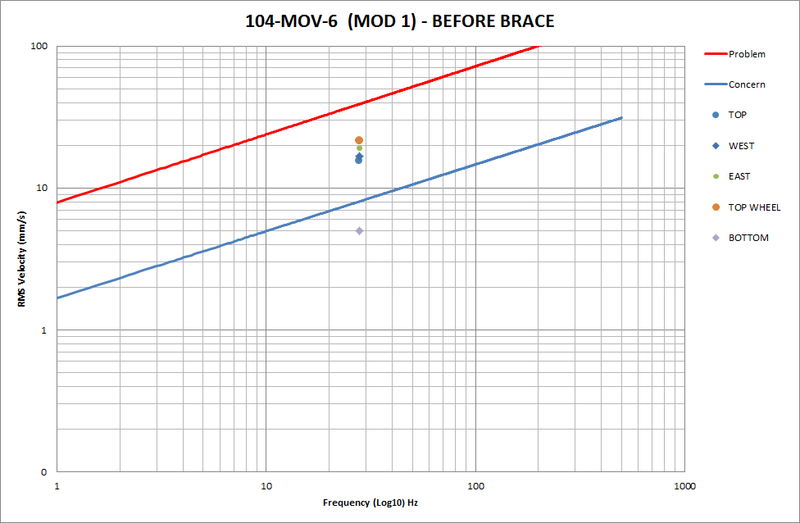 The brace at Position 14 showed a reduction in vibration but similarly the mainline vibration limited the overall vibration reduction possible. The 1”-2P04041-9119X pipework is part of the bypass line on Gas to Ejector module 2 and is only used when module 1 is shutdown. During a shutdown of module 1, vibration readings were found to be of concern. AVT were asked to investigate bracing the 1” Small Bore Connection pipework back to the mainline. AVT recommended that 3 No. Easy-Brace® assemblies were installed to support the Small Bore Connection pipework back to the mainline where possible. AVT were supplied were isometrics and dimensions of the pipework to design the Easy-Brace configuration. However, it was found that some adjacent steelwork prevented AVT from installing the brace as intended but the Easy-Brace® design was found to be easily adaptable and was able to overcome all limitations and restrictions found on site. Since module 2 was not in operation during the brace installation, the before and after vibration levels could not be taken. Instead a basic stiffness assessment was carried out by measuring the natural frequency of the pipework before and after the bracing was installed. 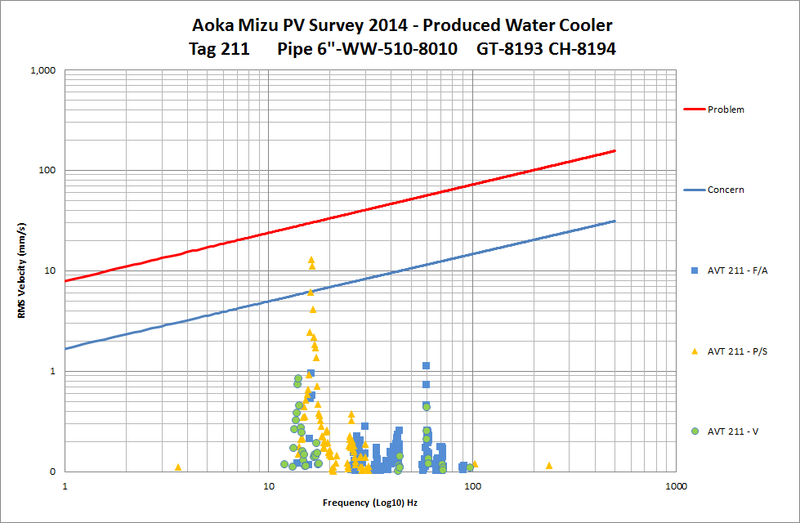 The change in natural frequency provides an indication of the change in stiffness of the pipework. Using equations for Simple Harmonic Motion the stiffness (k) is proportional to the frequency (f) squared. 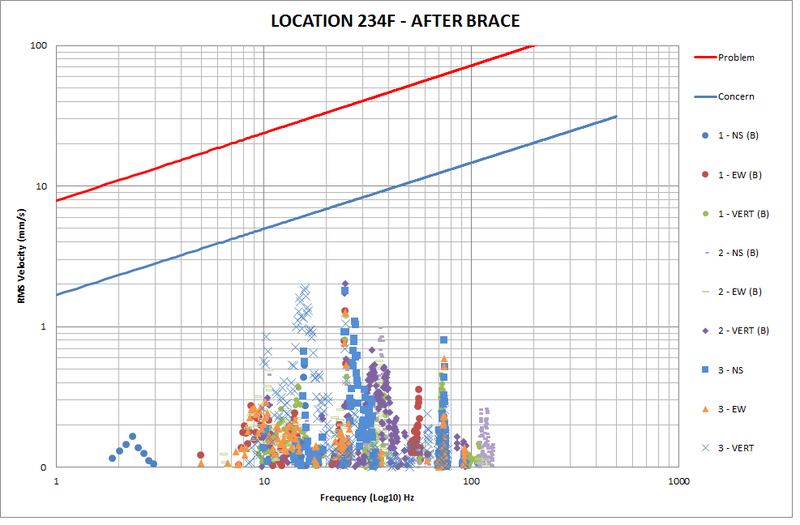 The before and after natural frequencies measured indicate a significant improvement in the pipework stiffness, up to 40 times greater with the braces installed. 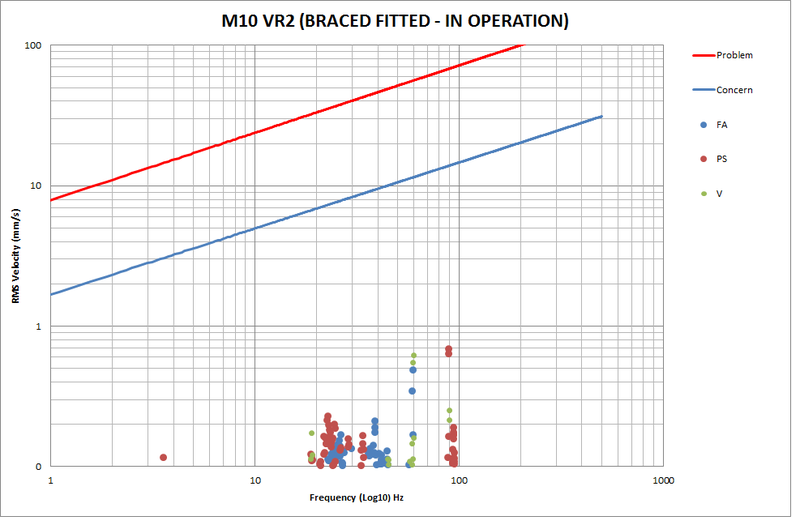 It is important to note that without taking operational vibration measurements, the effectiveness of the bracing cannot be verified. AVT always recommend ‘after’ measurements to ensure the new natural frequency does not coincide with an excitation frequency. AVT was asked to carry out a pipework vibration survey of approximately 40 No. accessible flow transmitter Small Bore Connection pipework configurations. It was observed that no two pipework configurations were exactly the same and a significant number had vibration levels over the EI ‘Concern’ line. 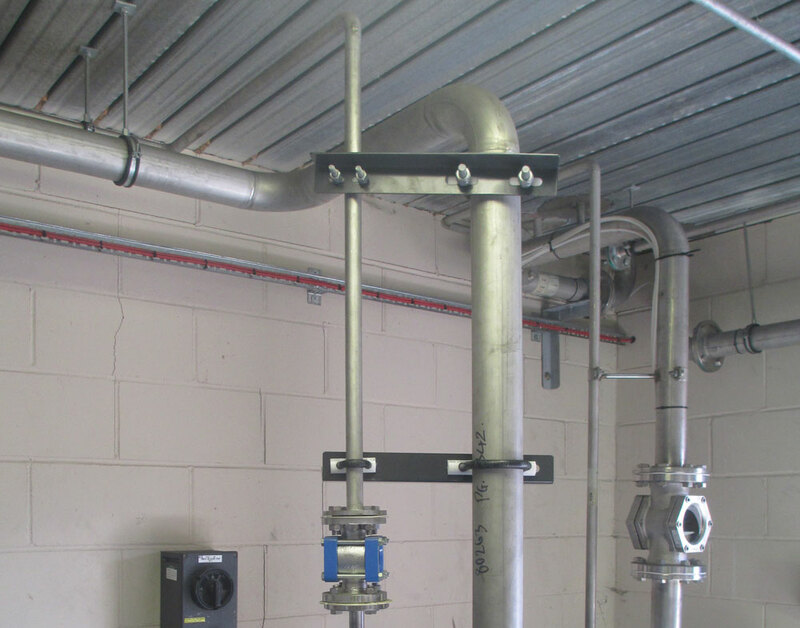 AVT recommended that the most vulnerable flow transmitter pipework configurations should be braced back to the mainline and subsequently the client asked AVT to provide a universal brace design that could be applied to initially 3 No. Small Bore Connection locations but subsequently could be later rolled out across the plant without the need for redesign. 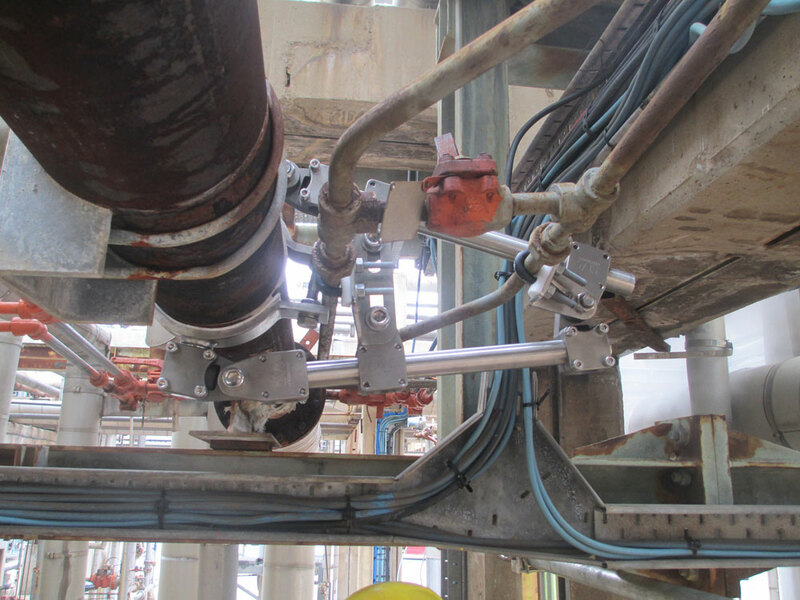 AVT was able to utilise the Easy-Brace® system with some new bespoke bracketry off the Easy-Brace® uni-clamps to support the nominal ½ ” NB transmitter pipework at various heights and angles. 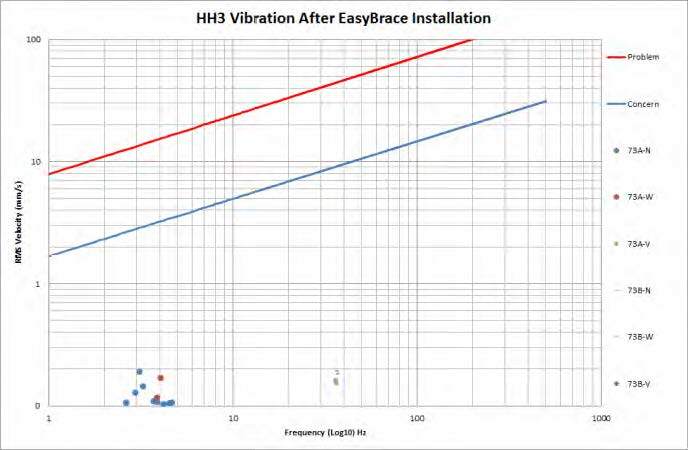 The Easy-Brace® installation resulted in significant reduction in vibration levels which was confirmed by before and after vibration measurements. A pipework vibration survey by AVT recommended the bracing of a number of poorly supported small bore pipes that showed high levels of vibration intermittently during various production processes. 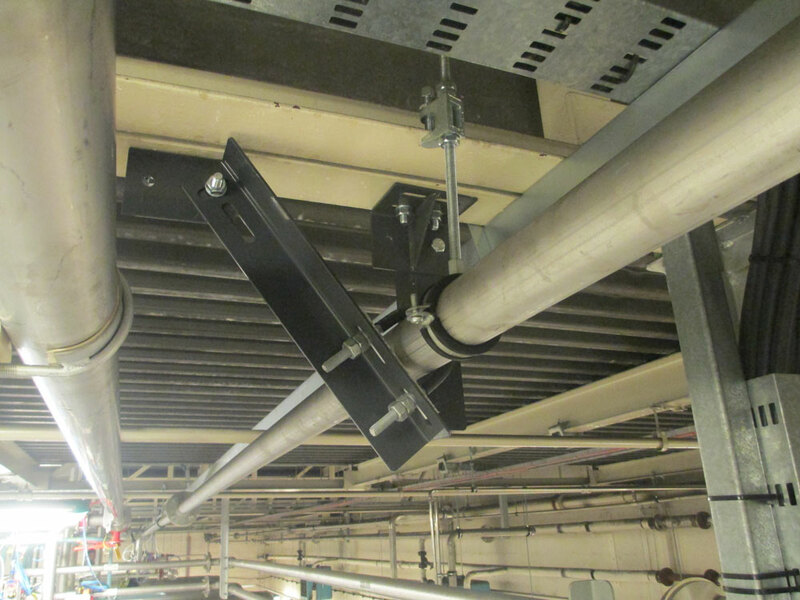 AVT designed a number of bespoke brackets that could be installed to the existing steelwork or to the floor or wall with sufficient capacity for dimensional adjustments on site. 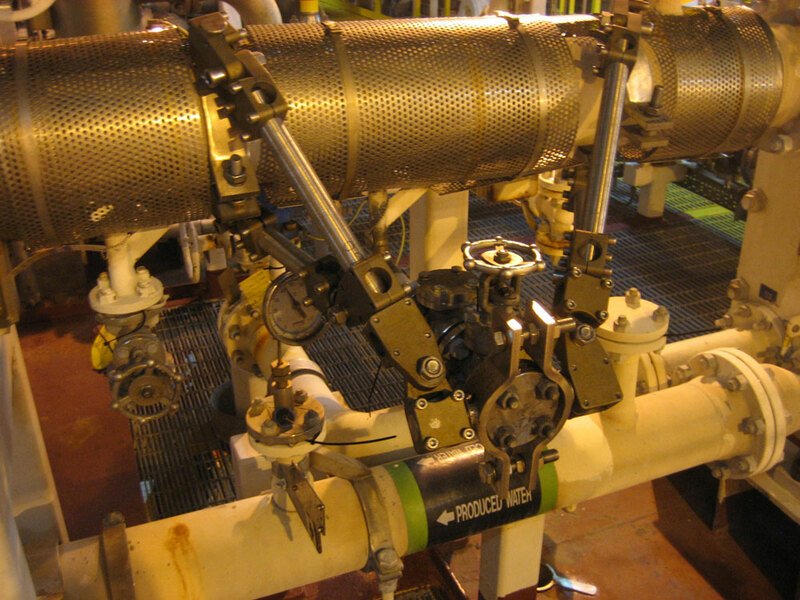 Following an asset wide vibration survey conducted by AVT in October 2014 on a Floating Production, Storage and Offloading vessel (FPSO) in the North Sea, AVT were asked to design brace solutions to support the Small Bore Connection pipework that was deemed ‘at risk’ of vibration induced fatigue. AVT recommended and supplied AVT’s ‘Easy-Brace®’ system for the 12 No. identified Small Bore Connections and these were installed on HP Compressor A and LP Compressor B by the operator. A validation visit was subsequently carried out by AVT in Dec 2015 to assess the installation visually and also the performance of the installed braces by comparing the current vibration levels to the previous survey measurements. 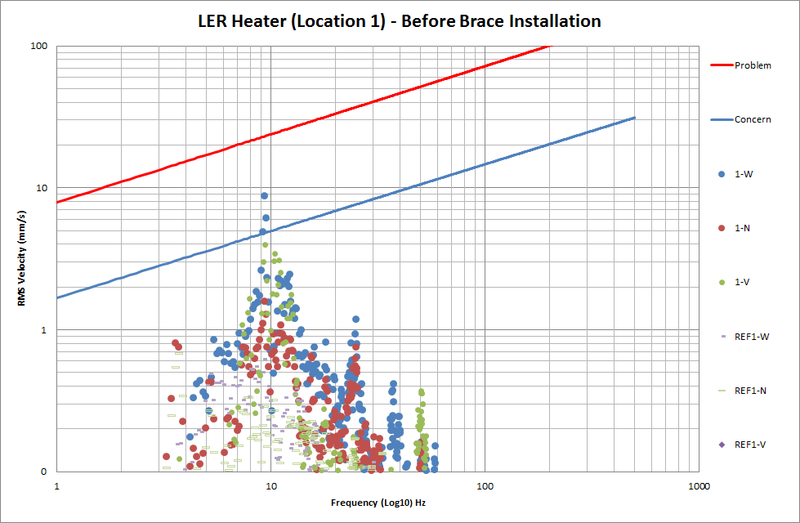 The Easy-Brace® installations generally resulted in good reductions in vibration levels at the install positions as typically shown below. 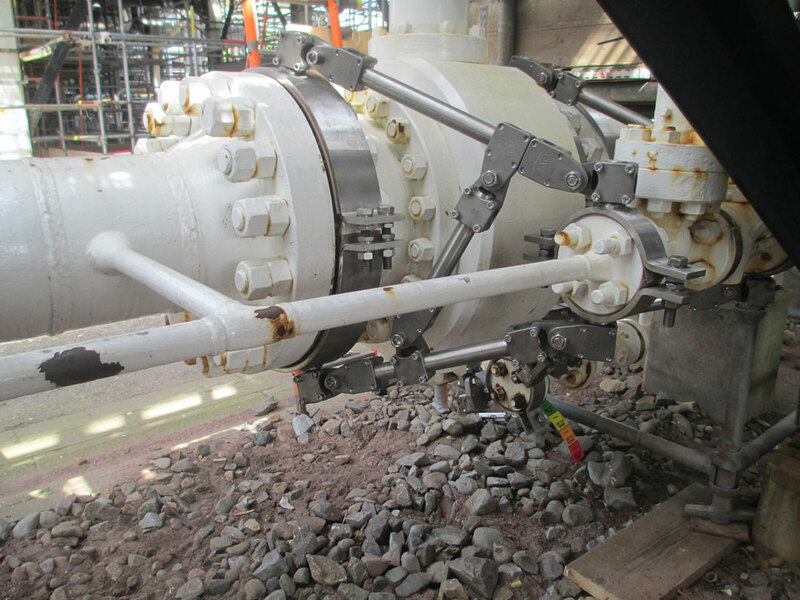 Previous Small Bore Connection survey by AVT in Dec 2014 on an unmanned platform in the North sea highlighted potential fatigue failure issues on a 2” DC 53 001 D6R drain line branch off the 6” PG 10 001 D6R main production line. The primary area of concern was the welded joint between the drain line and connecting 3/4” SBC valve that had been braced to the platform deck. 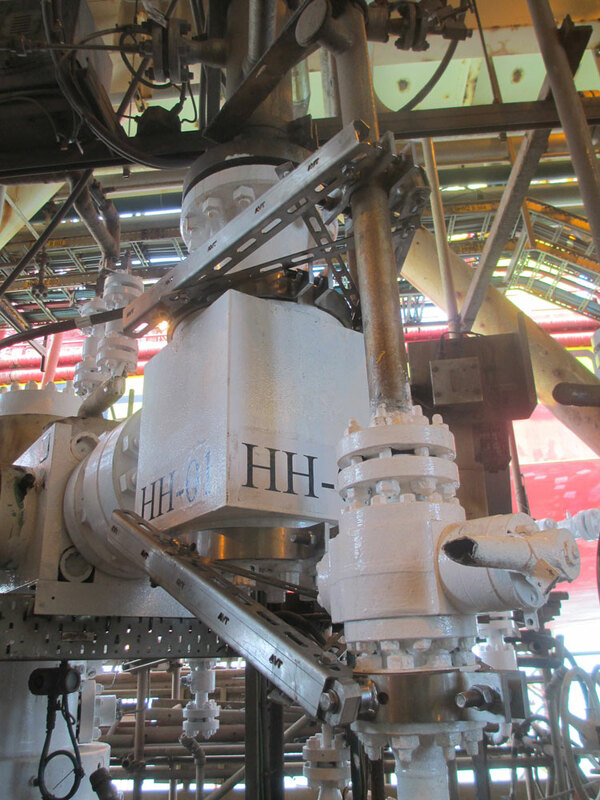 It had been observed that rough sea states can result in significant movement of the wellheads and associated pipework, particularly at wellhead HH3. Large differentials in movement between the wellheads and the fixed ¾” Small Bore Connections are likely to cause high stress levels in the welded joint. AVT recommended that the existing braces to the deck were removed and AVT Easy-Braces® are installed to support the drain line and ¾” Small Bore Connections in three planes back to the 6” mainline/wellhead to minimise differential movement. 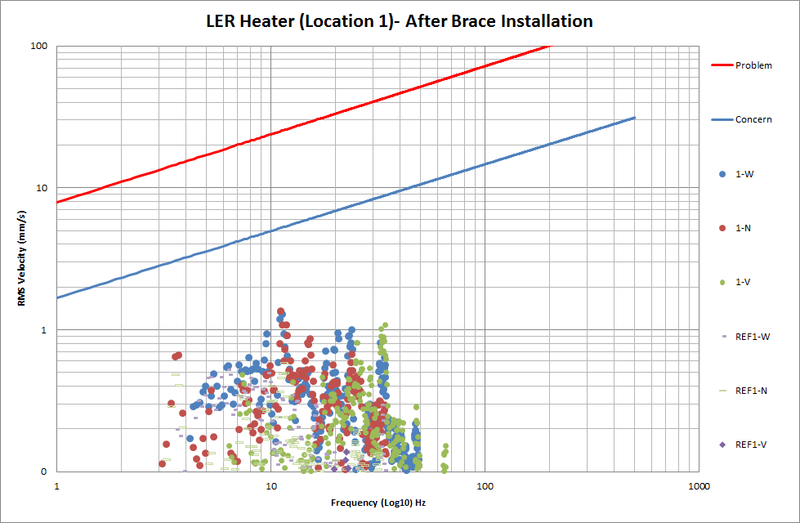 The Easy-Brace® installations resulted in good reductions in vibration levels at the install positions as typically shown below.